A place to put stuff. Hopefully this helps the next time you need to get the serial number of a Mac in Golang! Today I released TrumpBlockr, a WebKit Content Blocker that hides or blocks Donald Trump related content from Mobile Safari. I had quite a few laughs developing it, and showing it to friends and family. Maybe you’ll get a kick out of it too. Unclean whitespace in source code makes me sad. The following will remove all trailing whitespace in files within the current directory that end with .h or .m, (which makes me happy). I’ve only tested this on OS X. Easy tracking of which specific AutoPkg recipes you care about. 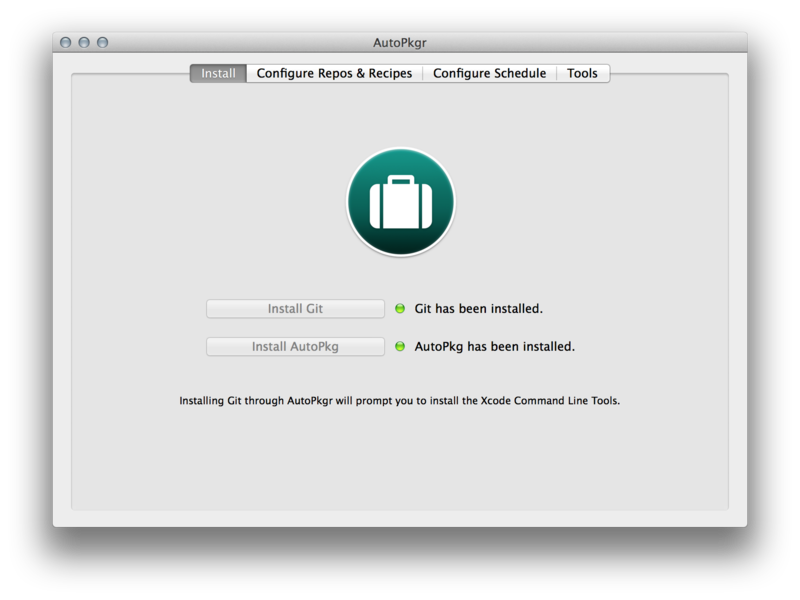 Automatic scheduled checks for new downloads that are available as part of the AutoPkg recipes you subscribe to. Email notifications when new items are downloaded. It’s been a ton of fun developing AutoPkgr, and best of all the response from the community has been fantastic. Here’s to making awesome tools and sharing them. I recently needed to test a complex LDAP query in a Python script I was writing. I realized shortly after beginning to construct the query that I had never done anything more than a simple a=b or a=b* before, (where * is the wildcard). The solution is rather simple, albeit awkward due to the position of the binary operators. You’ll notice in the examples below that the operators are positioned before each operand. So rather than a & b, you would write &(a)(b). Here’s a Python one-liner that prints the Java vendor on OS X clients, (e.g., Apple or Oracle). Here’s a way to query Active Directory for group membership status with the ldapsearch utility. In my case, this was used to check if a user is authorized before attempting to mount an SMB share at login on OS X clients. The -Q option causes ldapsearch to use SASL quiet mode and not prompt for a password, which works if a Kerberos ticket is present. echo "$console_user is a member of $group." echo "$console_user is NOT a member of $group." The fine folks at JAMF Software have posted a video of the talk I gave at this year’s JNUC. I had a great time in Minneapolis and hope to attend again next year. The slides for this talk are available on my GitHub if you want to follow along. It's not uncommon in the "lean startup" world for a company to have a strong aversion to onsite infrastructure. This presents IT administrators with the challenge of hosting and scaling their infrastructure elsewhere. Although there are many similarities between hosting the JSS locally and in "the cloud", there are some key differences to be aware of to ensure a successful deployment. Today I decided to switch to iTerm2 on OS X. Shortly after making this decision I was frustrated by not being able to “jump” between words with the option-arrow shortcut. 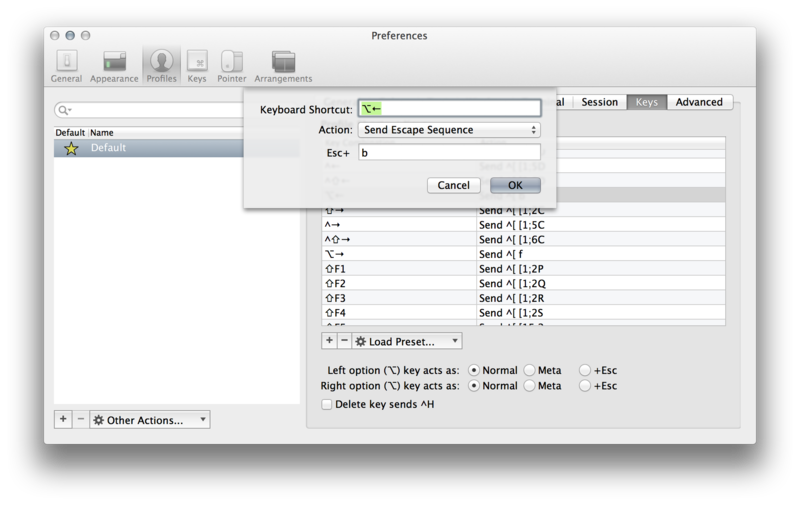 Fortunately, the solution is rather simple — just modify the option-left/right arrow shortcuts in Preferences > Profiles > Keys. The “Action” should be “Send Escape Sequence” + b for jumping backwards and f for jumping forward, (e.g., ^[b, and ^[f). I know I’ve tried iTerm in the past, and I’m pretty sure not being able to do this right away kept me from continuing to use the tool. After making this change everything has been swell, though. I’m very pleased to announce that I’ll be speaking at the 2013 JAMF Nation User Conference in Minneapolis, MN. I’ll be discussing my experience with hosting the JSS on Amazon Elastic Compute Cloud (EC2), along with any lessons learned during the process, (of which there are many). The three day conference is being held at the Guthrie Theater from October 15-17. Hope to see you there! My name is James Barclay. I'm a software developer and designer from Ann Arbor, MI. I like Vim, Python, Objective-C, Swift, Markdown, *nix, and macOS. I put stuff here so I won't forget it. For a more complete story, and to see my résumé, check out the About page.